NYC is Blue: Latino Sports: "NYCFC Supporters Club First Meeting"
Latino Sports: "NYCFC Supporters Club First Meeting"
New York, NY – When Manchester City and the New York Yankees partnered up to acquire Major League Soccer’s 20th expansion club and formed New York City FC (NYCFC), it was a matter of time before a supporters group would be formed. 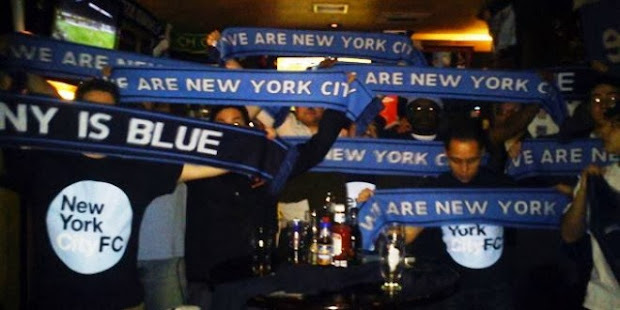 On Saturday, February 22, 2014, the NYCFC Supporters Club held their first meeting at the Football Factory at Legends. Facilitated by Chance aka @NYisBLUE, he addressed the purpose and direction of the supporters group. At the moment, Chance is working on making NYCFC SC a nonprofit. In addition to working on the by-laws and mission statement, he expressed the need of having others involved throughout their growth process. What I found unique about this supporters club is that they are following a club whose only history involves the Yankees and Manchester City. Out of everyone who was present, only one individual was a Manchester City supporter. Let’s be honest, most supporter clubs are centered around teams with a past. Very few supporters clubs will be able to claim that they were the pioneer supporters club of a team that has yet to kick the ball. Along with the supporters clubs, there’s also the writers and artists who will invest their time and energy raising awareness about the club. As easy as it would be to dismiss their efforts, I commend them for taking a position. On so many levels, they have the power to play a role in shaping their club’s identity. Majority of us support a club that’s already established. Very few of us are brave enough to follow a club with a controversial ownership who has yet to field a team. Very few of us will declare their support for a club that has yet to unveil their kits and crest. Granted, not everyone is going to agree with their movement because the integrity of it will be questioned on a regular basis. And you know what? Our decision to agree to disagree is what makes our passion for the beautiful game fantastic. Personally speaking, I’m looking forward to see how they evolve over time. As easy as it is to pass judgement on them, I hope some of us will take the opportunity to remember how we felt when we were formed and joined our supporters club. It’s an exciting and scary feeling because of the work and dedication behind. For those of us who are members of a supporters club, I’m sure we can remember the excitement we felt when we attended our first meeting. I’m also sure many of us remember the pride we experienced when purchased our first supporters club scarf because we had something to declare our identity while making a contribution to our cause. All I’m saying is that NYCFC SC has the right to feel the same emotions many of us felt when we first started. With that said, I wish NYCFC SC the best of luck and I look forward to the day when our clubs face each other in the future. 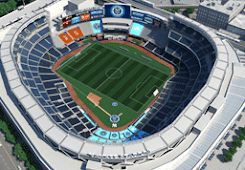 Please follow them on twitter at @NYCFC_SC. A very balanced look, especially coming from a Cosmos fan. Plus, he's a great guy to boot. Thanks, Cesar!